Gallia Academy junior Ashton Webb (11) drives past Athens sophomore Laura Manderick (14), during the second half of the Blue Angels’ 58-43 win on Saturday in Centenary, Ohio. GAHS freshman Ryelee Sipple goes in for a layup in front of Athens’ Lilly Mills (left), during Saturday’s non-conference bout in Centenary, Ohio. CENTENARY, Ohio — Just in time for the holidays, the Blue Angels are back in the win column. 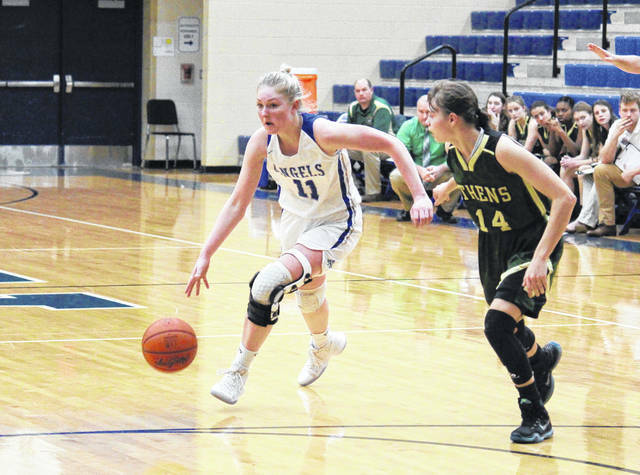 The Gallia Academy girls basketball team snapped its four-game skid on Saturday in Gallia County, defeating non-conference guest Athens by a 58-43 tally. The Lady Bulldogs (2-8) — who’ve now dropped back-to-back decisions — took its only lead of the game at 3-2, with 6:44 left in the first quarter. The Blue Angels (5-4) regained the lead 17 seconds later and ended the first quarter with a 23-10 advantage. 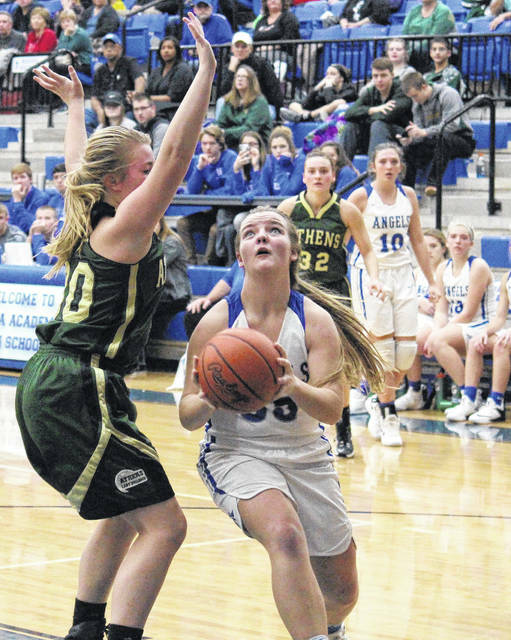 GAHS stretched the margin to 16 points, at 29-13, by the 5:50 mark of the second quarter, but Athens ended the half with a 13-to-5 run, trimming the Blue Angel lead to 34-26 at the midway point. The Lady Bulldogs began the second half with a 12-4 run, tying the game at 38 with 4:22 left in third quarter. Gallia Academy reestablished the lead just 16 seconds later and finished the game on a 20-to-5 run, sealing the 58-43 victory. In total, the Blue Angels shot 24-of-54 (44.4 percent) from the field, including 2-of-6 (33.3 percent) from three-point range. Meanwhile, Athens was 13-of-47 (27.7 percent) from the field, including 7-of-34 (20.6 percent) from beyond the arc. From the free throw line, GAHS was 8-of-13 (61.5 percent) and AHS was 10-of-17 (58.8 percent). 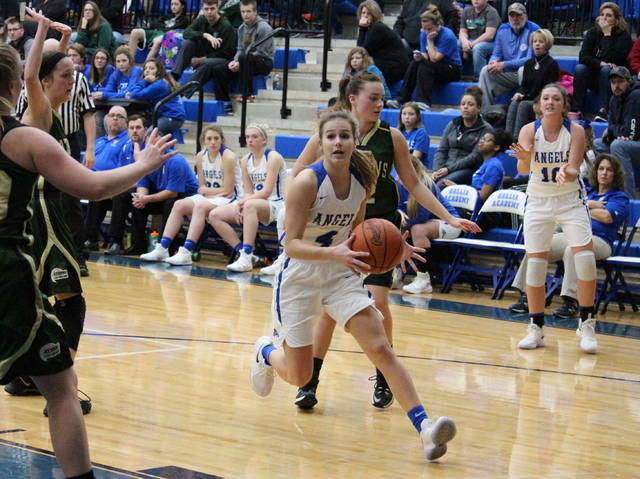 For the game, Gallia Academy claimed a 43-to-31 rebounding advantage, despite the Lady Bulldogs taking an 18-16 edge on the offensive boards. GAHS also earned an 11-to-10 assists advantage and a 8-to-2 steals edge, while recorded the game’s only five blocked shots. Athens won the turnover battle by a 16-to-12 count. The Blue and White offense was led by Alex Barnes with 19 points, 10 of which came in the fourth quarter. Ashton Webb finished with 15 points for the hosts, while Hunter Copley and Ryelee Sipple had nine points apiece. Copley and Webb were each responsible for a three-pointer for the in win. Maddy Petro and Abby Cremeans rounded out the winning total with four and two points respectively. Sipple led the hosts on the glass with 11 rebounds, followed by Petro with nine. Copley dished out a game-high four assists, while Barnes had three helpers. Petro led the Blue Angel defense with three steals and two blocks, followed by Copley with three steals and one rejection. 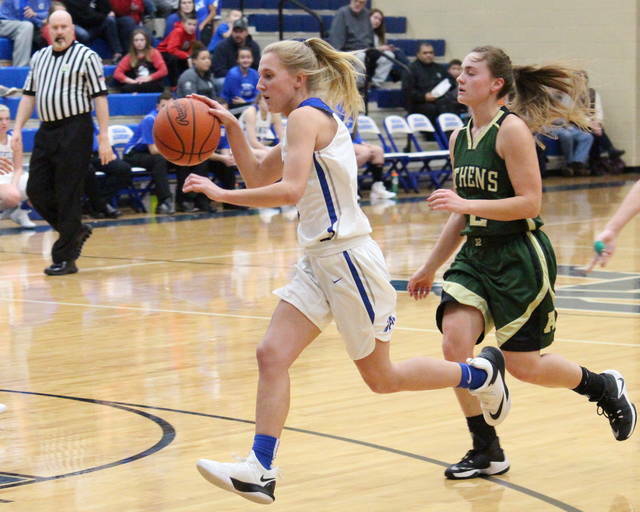 Laura Manderick led the guests with 21 points, followed by Emma Harter with 11. Both Manderick and Harter hit a trio of three-pointers in the setback. Lilly Mills and Emmarald Francois scored four points apiece for AHS, while Mindi Gregory finished with three points on a trifecta. Harter led the guests with 11 rebounds, followed by Kaylee Stewart with eight. Harter and Manderick earned three assists apiece, while Harter and Gregory both picked up a steal. The Blue Angels have 10 days off before returning to action at Point Pleasant on Jan. 2. “Going in, this was a game that we felt like we should win,” Justice said. “We go to Point Pleasant on Tuesday and then we go to Fairland. Hopefully we’ll be going into Fairland with two wins. Athens and Gallia Academy won’t face again this season. With one game left against a Tri-Valley Conference Ohio Division opponent, the Blue Angels are 3-0 against teams from the seven-team league. Editor’s note: This story will appear in Wednesday’s edition of the Gallipolis Daily Tribune.